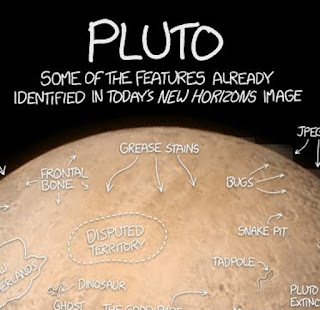 Over on xkcd.com, there was a humorous take this week on new naming conventions for the features of Pluto. See more here. Also, on The Late Show with Stephen Colbert YouTube channel, Stephen Colbert discussed Pluto with Neil deGrasse Tyson and then settled their differences over Klondike Bars (not a sponsor). Enjoy! Finally, on colbertlateshow.com, have fun trying to "Escape from the Man-sized Cabinet," a humorous and fun online game. See more here.